Rheem Point of Use 8 Imperial Gal Electric Water Heater with 6 Year Warranty. The Rheem Performance Line. Exclusive to the Home Depot! An 8 imperial gallon electric point of use water heater, this model has a 6 year limited tank and parts warranty plus a 1 year in home labour warranty. This unit comes with a 1500 watt element and an automatic thermostat which keeps the water at the desired temperature, providing fast and quick hot water delivery. Requires 120 volt electricity. Cord included. A 1500 watt element for fast water temperature recovery. Rheem High Efficiency Condensing gas water heater. A 40 gallon gas water heater providing an ample supply of water to households with 2-4 people. With an efficiency rating of .80, this is Rheem's most efficient tank type gas water heater, exceeding Energy Star Phase II requirements. Featuring a Honeywell, electronic ignition (no pilot light), gas valve with self diagnostic capabilities that alerts the user to the operating status of the unit. A brass drain valve upgrade for superior leak protection. 40 000 BTU input for exceptional hot water delivery. Want better efficiency, limitless hot water, and space savings? Consider Rheem condensing tankless (SKU # 1000730128). The Rheem Medium Duty Gas water heaters short heights and small jacket diameters result in greater installation flexibility and makes this unit ideal for easy replacements. Typical applications include large residences, small restaurants, apartments up to 4 units and small office buildings. 160 maximum operating temperatures. Factory installed CSA/ASME temperature and pressure relief valve reduces installation time. 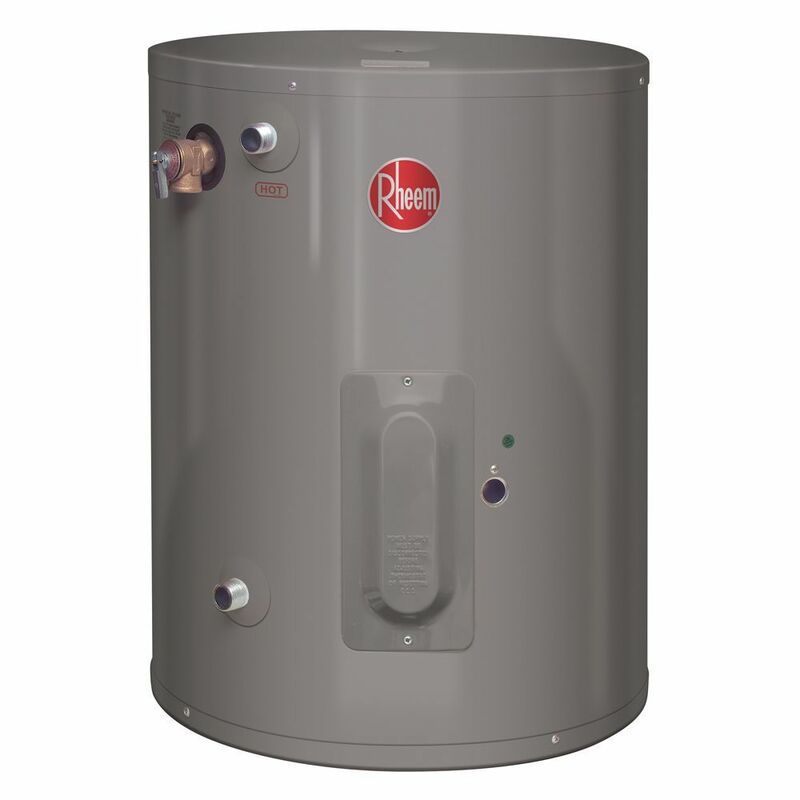 Rheem Marathon point of use water heater with exclusive lifetime tank warranty. The polybutene design makes the tank impervious to corrosion, and eliminates the need for an anode rod (preventing sulphur odours). Perfect for rural areas, well applications, and areas with very hard water. Foam to floor insulation for high efficiency and light weight for ease of installation. 240 volt electricity. Point of Use 8 Imperial Gal Electric Water Heater with 6 Year Warranty. The Rheem Performance Line. Exclusive to the Home Depot! An 8 imperial gallon electric point of use water heater, this model has a 6 year limited tank and parts warranty plus a 1 year in home labour warranty. This unit comes with a 1500 watt element and an automatic thermostat which keeps the water at the desired temperature, providing fast and quick hot water delivery. Requires 120 volt electricity. Cord included. Point of Use 8 Imperial Gal Electric Water Heater with 6 Year Warranty. is rated 5.0 out of 5 by 1. Rated 5 out of 5 by TomTom from Perfect for our Trailer Our hot water tank in our trailer failed this summer. We replaced it with this excellent hot water tank that sits out side our trailer. Easy to connect and provides all the hot water we require all the time! We are very satisfied. Can I plug this heater into a solar panel system? Please contact Rheem Canada (800-268-6966) for more information. Is this unit thermostatically controlled? If so, what is the range? does the 10 gallon tank plug into a 120 socket or is it hardwired? Do you sell this product with a 240v 3000 watt heater instead of the 220v 1500 watt? can we use this water heater for a 240 volt and change the elment to 240? No, the model listed is relatively small for the uses provided. It is recommended to go with at least a 30 gal (us) model to effectively use this heater for the applications mentioned. What are the dimensions of this tank? I need enough water for a kitchenette for kitchen sink and dishwasher. Would this be sufficient or would a 4 or 6 galleon tank be sufficient? Also are there any tanks with 240 that might have faster recovery time. Is this 10 gal tank imperial or US gal? This unit is rate in imperial gallons.